Carpets are a beautiful addition to accentuate your house, but everyone knows that it can be tricky to keep them spick and span. Like moths drawn to flames, carpets seem to attract dust and dirt, not to mention the occasional spills that may stain your carpet. Thankfully, we are here to help you with the best carpet cleaners 2019. Instead of hiring an external carpet cleaning company, why not do it yourself? With the best carpet cleaner for your needs, keeping your carpets clean will no longer be a hassle or a hefty expense. For the five best carpet cleaners, we have researched the market with these considerations in mind. There is a wide range of carpet cleaners available in the market. Some carpet cleaners are designed to be light and portable, while others are designed for intensive carpet cleaning and can be heavier and bulkier; going up to 50lbs or more. Some carpet cleaners are specifically designed to handle pet hair removal from the carpet. There are also carpets that come with a built-in soap dispenser and others that require you to install a special attachment for soap dispensing. Ultimately, the perfect design depends on your personal needs. Do you have a lot of carpeting in your house? If your answer is yes, you may want to get a carpet cleaner that is portable and easy to maneuver around the house. Of course, there are also many other factors that you need to consider. For example, if your house carpeting requires very frequent upkeep (maybe because you have three dogs or other furry pets at home), you may want to consider getting a carpet cleaner that’s not just easy to move around the house, but also capable of handling pet hair and other intensive cleaning duties. As with other cleaning equipment like the vacuum clean﻿er, suction is one of the most important criteria that you should consider when deciding on a carpet cleaner. We all know that carpet cleaners with higher suction power usually do a better job at removing the excess water from your carpet after you are done with removing the stains. Of course, nothing comes for free— higher suction power comes at a price. Again, you should assess your own needs so that you don’t end up with a carpet cleaner that is weak or one that is overkill. Basically, you don’t want to be skimping on your needs, but neither do you want to end up spending more than what’s needed! No-frills carpet cleaners are great if you are just looking for a basic carpet cleaner. However, if you have other special considerations or needs, then it pays to consider carpet cleaners that come with additional features (and of course a higher price). Some carpet cleaner models include pet hair filters, which are great for pet owners who may have trouble getting rid of pet hair stuck in the house carpets. If you live in a multi-storeyed or you have lots of furniture at home, you may want to consider carpet cleaners that come with additional attachments for easy cleaning of stairs or furniture. There are also carpet cleaners that come with fancy rinse cycles— these carpet cleaners can extract soap once you are done with shampooing or soaping the carpet. The average price of a carpet cleaner tends to be higher than that of a vacuum cleaner. This is understandable since carpet cleaners can usually perform more functions than vacuum cleaners. Indeed, getting a carpet cleaner is an investment and you should definitely consider the price when deciding on the carpet cleaner model to buy. Generally, as mentioned earlier, carpet cleaners with higher suction power and additional features are usually more expensive than those that have more basic features. A heavy-duty cleaner usually costs more than a light-duty one. Of course, there can be exceptions to these and that’s where we come in to help you identify and grab a good deal on the best carpet cleaners 2019. Hoover is known for its vacuum cleaners and its carpet cleaners are no exception. At about 18lbs, the Hoover Basics Power Scrub Deluxe is a portable upright carpet cleaner that gets the job done despite its light weight. This carpet cleaner comes with a smart tank system so that it’s easy to fill, empty and clean the machine without much fuss. It has two separate tanks for dirty and clean water which can be rinsed and washed very easily. Other cool features include its automatic detergent mixing design, which helps homeowners with the mixing of detergent of water for optimal cleaning results. Homeowners can also utilize its heated cleaning technology, where forced heated air can be directly applied to the carpet to help lift and remove stubborn carpet stains and expedite the drying time. Hoover also has an exclusive SpinScrub technology, which sports a 360-degree cleaning that claims to gently dislodge dirt and debris, and clean all sides of your carpet and upholstery fibers without leaving any corners behind. Many Amazon customers have positive reviews in terms of the Hoover Basics Power Scrub Deluxe’s suction power. Its DualV nozzle purportedly provides strong and even suction to clean surfaces quickly without leaving out a spot. Indeed, many customer reviews have touted this carpet cleaner’s ability to get rid of tough stains and debris which could not be removed by vacuuming. Besides the carpet cleaner, the Hoover Basics Power Scrub Deluxe also comes with stair and upholstery tools, a storage bag, a cleaning hose and a sample bottle of cleaning detergent. To cater to the user’s needs, the carpet cleaner is also equipped with four easy-to-access handles for easy transport of the cleaning unit. The Hoover Basics Scrub Deluxe come with a two-year warranty. The Hoover Basics Power Scrub Deluxe is a force to reckon with if you are on the hunt for the best carpet cleaner 2019 that is powerful, but also light and portable. Right now, Amazon is having a great discount for this carpet cleaner so be sure to check it out! At 25lbs, the Rug Doctor Deep Carpet Cleaner is just a few pounds heavier than the Bissell PowerLifter PowerBrush. This upright carpet cleaner may not be the lightest on our list of top five picks, but it is definitely not hard to move this carpet cleaner around the house. If you want a deep cleaner that can tackle different areas of your house and not just flat carpeted areas, then this model is the one for you. 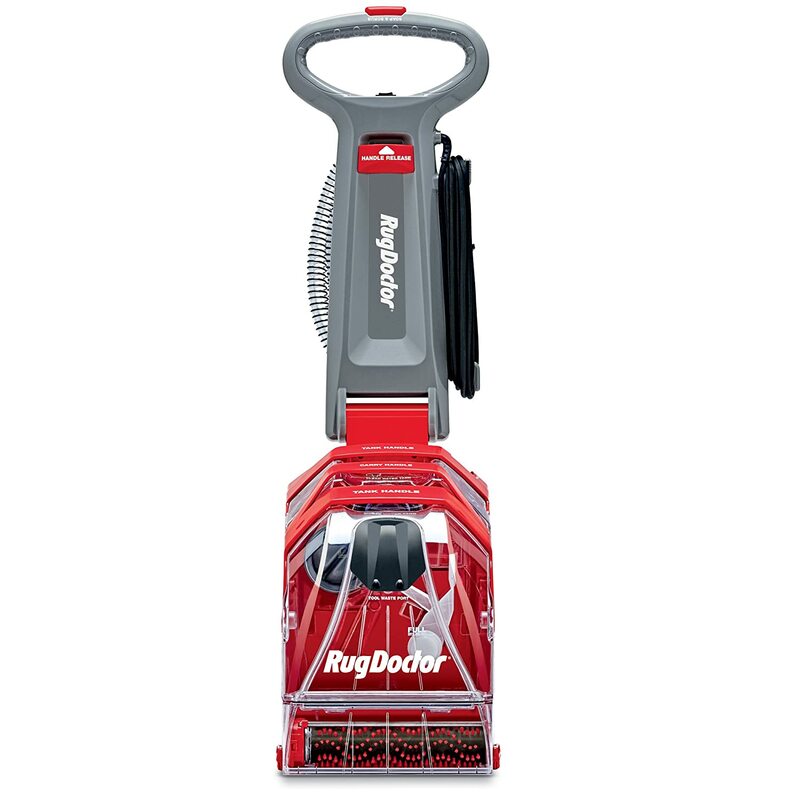 The Rug Doctor comes with a range of upholstery attachments that are useful for cleaning carpeted stairways, furniture, pet beds and other places that may be difficult to reach. Rug Doctor boasts that its carpet cleaner provides 75% more suction than many other reputable carpet cleaner brands. There seems to be some consensus on this: many Amazon customers agree that the Rug Doctor Deep Carpet Cleaner provides stronger suction than what they have experienced before with other brands. There are some who even claim that this carpet cleaner gets the job done in one single pass. The Rug Doctor Deep Carpet Cleaner comes with a “Super Boost” mode which is great for cleaning high-traffic areas. Otherwise, the normal mode provides the gentle cleaning needed for more delicate areas. This ability to customize the cleaning experience is what makes this carpet cleaner a versatile deep cleaning machine. For all its merits, there are a handful of Amazon customers who reported problems with getting the cleaning spray to emit. With its two-year warranty, you can easily get this fixed if this problem pops up during the warranty period. Priced slightly below $250, the Rug Doctor Deep Carpet Cleaner is definitely one of the mid to higher-end options when it comes to a carpet cleaner. For a through deep cleaner that comes with fantastic suction power and an array of upholstery attachments to choose from, I would say that this is the best carpet cleaner 2019 if you want a carpet cleaner that is capable of intensive and vigorous cleaning. For the ultimate multi-purpose cleaner, look no further from the Hoover Max Extract All-Terrain Carpet Cleaner. What’s special about this carpet cleaner is its ability to clean both carpeted and hard floor surfaces effectively. This is all thanks to Hoover’s patented SpinScrub technology as well as the all-terrain cleaning feature that is specific to the Hoover Max Extract All-Terrain Carpet Cleaner. Additional features include its automatic detergent mixing system so you don’t have to worry if you got the right mix of detergent and water for cleaning, an auto rinse function that helps to rinse your carpet and hard floors so that no soap residue is left behind, a SpinScrub hand tool that helps you clean stairs, upholstery and stains with minimal hassle, as well as an array of other extension tools for cleaning furniture and upholstery. In terms of suction power, many Amazon customers have also raved about its ability to extract most of the water out from the carpets and floors, leaving the surfaces only slightly damp and drying up within an hour or so for carpets (faster for hard floors). Another point that customers have highlighted would be the ease of cleaning the Hoover Max Extract All-Terrain Carpet Cleaner with its two separate containers that are easy to empty and wash.
For just below $200, you can get this carpet cleaner and its accompanying extension tools. Other bundles are also available for just ten to fifteen more bucks if you would like additional tools like its SpinScrub brushes, and two bottles of concentrated detergents. Like the Bissell PowerLifter PowerBrush, this carpet cleaner has won much acclaim from Amazon customers to date, amassing over 1,000 4-star to 5-star ratings from satisfied customers. So, if you are on the look-out for the best carpet cleaner 2019 that can cover all grounds at home, be it carpets or hard floors, then the Hoover Max Extract All-Terrain Carpet Cleaner is the clear choice for you. If you only need to worry about small carpeted areas and you want a carpet cleaner that is portable, the Bissell PowerLifter PowerBrush model is the perfect carpet cleaner for you. At 22.5lbs, the Bissell PowerLifter PowerBrush is quite lightweight. Its upright design makes it easy to move this carpet cleaner around your carpeted areas. This carpet cleaner is designed to take hot tap water which is useful when it comes to cleaning up stubborn stains that can be a chore to remove. For a small carpet cleaner, the Bissell PowerLifter PowerBrush packs a punch with its surprisingly strong suction. According to Amazon reviews, many customers have said that this carpet cleaner leaves the carpet only slightly damp post-cleaning, which means that it is able to draw out most of the water from the carpet fibers. Do note though, that the suction can pull out pet hair. While the Bissell’s lint screen prevents pet hair from entering the machine, it’s still best to vacuum your carpet before cleaning it if you have pets at home. While the Bissell PowerLifter PowerBrush doesn’t come with extra attachments, it is pretty self-sufficient for a portable carpet cleaner. Its water tank is a 2-in-1 design that keeps the clean water separate from the dirty water: the heavy-duty bladder is inside the tank holding clean water, with the dirty water surrounding it and not in contact. This carpet cleaner also comes with another nifty design with a built-in measuring cup for water and detergent. Currently, the Bissell PowerLifter PowerBrush is going at less than $100. For less than $30, you can consider its add-on choices for a pet stain remover bundle, professional deep cleaning bundle, etc., all of which would come with the respective bottled concentrates for the designated cleaning purposes. This carpet cleaner also comes with a one-year warranty. With over 1,000 Amazon customers giving this carpet cleaner a 4-star or a 5-star rating, we can be sure that this carpet cleaner is the best portable carpet cleaner 2019 option. If you have the money to splurge and you are looking for a professional-grade carpet cleaner, the Bissell Big Green Deep Cleaning Carpet Cleaner is something that you should certainly consider. At 55lbs, this is the heaviest carpet cleaner of the lot in our list. Unlike the Bissell PowerLifter PowerBrush, this Bissell model comes with two tanks (much like the Hoover carpet cleaners mentioned earlier): one for dirty water and one for clean water. This makes for easy cleaning and maintenance when it comes to the Bissell Big Green Deep Cleaning Carpet Cleaner. For a professional grade carpet cleaner, many Amazon customers have reported that they find it easier to use than other rental carpet cleaner models. With the Bissell Big Green Deep Cleaning Carpet Cleaner, many Amazon customers find that it’s amazing when it comes to eradicating even the toughest stains from coffee, red wine, meat sauces and pet hair or poo. This carpet cleaner’s DirtLifter PowerBrushes work wonders when combined with Bissell’s special cleaning formula, and can remove even the most stubborn of stains. One point to note is that the best method of using this carpet cleaner is to move it slowly and deliberately over the stain or mark until it is totally gone. While this takes time, many customers have remarked that they found it a worthwhile investment. In fact, many customers have raved about this Bissell model’s superb cleaning abilities and drying speed, which more than make up for the extra time taken to go over the stain. 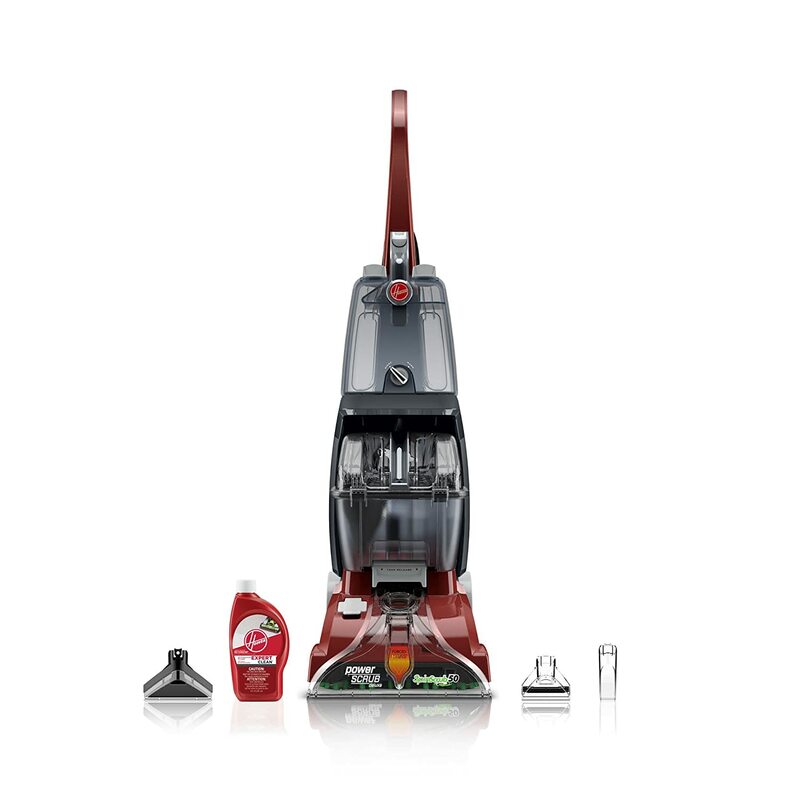 Besides the carpet cleaner itself, the Bissell Big Green Deep Cleaning Carpet Cleaner also comes equipped with cleaning attachments for users to clean hard-to-reach areas. The attachments are useful if you need to clean carpeted stairs, regular carpeted areas or even upholstery. Because of the large capacity of the dual tanks (1.75 gallon for each tank), you don’t have to trouble yourself with emptying the tanks as frequently as other carpet cleaners that come with smaller tanks. At its original list price which is about $600, this is an expensive investment, but it is definitely worth your money if you want a professional-grade carpet cleaner. What’s more, it comes with a five-year warranty and right now, Amazon is offering over $200 in discount if you purchase the Bissell Big Green Deep Carpeting Carpet Cleaner. With over 2,700 4-star to 5-star ratings on Amazon, you should seriously consider getting this carpet cleaner 2019 if you need a heavy-duty carpet cleaner and you can afford to splurge on something that is more expensive. We hope that we’ve given you a clearer idea of the best carpet cleaners 2019 that are currently available in the market. Whatever your needs, there will always be a carpet cleaner that gives you the most value. So, why not try one today? Rather than rent a carpet cleaner or hire cleaning services, invest in a good and reliable carpet cleaner this 2019 and save yourself some money in the long run!